Visit Debra for Her Giveaway! 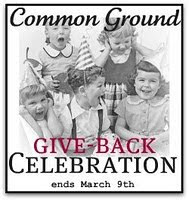 - Jill Ruth & Co.
Debra at Common Ground is having a Spring Giveaway---and who isn't ready for Spring?! She's celebrating her birthday, a new booth, and 350 followers. Wow! She also host's an online Bible Study, what a lovely lady she is! I know she'd love to have you help her celebrate! Hi Jill, you are so so sweet, I just love coming over here! Thank you for posting about my give away! So glad you came by today.